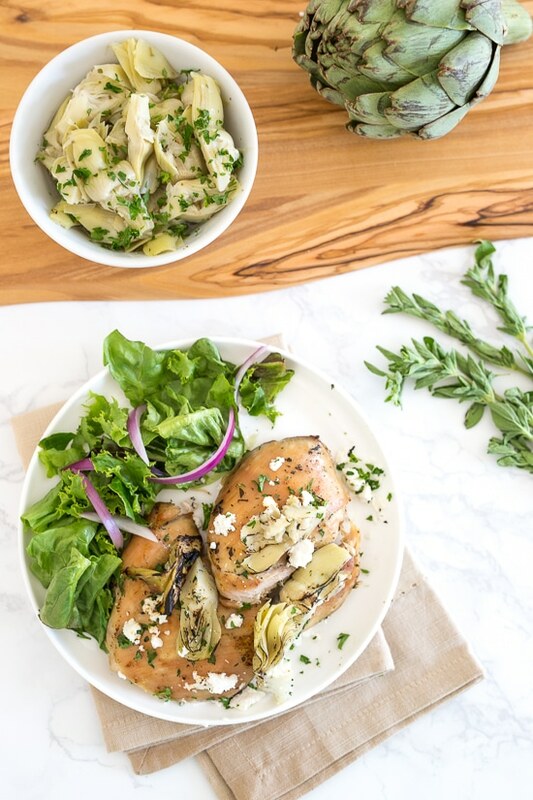 Chicken Thighs with Artichoke Hearts and Feta Cheese is made with just a few ingredients and is ready in less than 30 minutes! 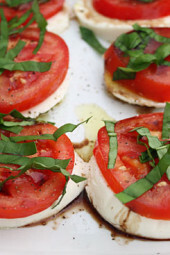 Perfect with a salad on the side for a quick, weeknight meal! My weeknights are pretty hectic and my dinners are usually quick meals I can make in under 30 minutes. This is a quick Greek inspired chicken dish and a great way to make boneless chicken thighs. I’m sure chicken breast would work well with this too. Perfect with some fresh lemon and a Greek salad on the side. This recipe is such an oldie from my site, I decided to re-shoot and revive it from the archives. I almost forgot how good it was! Combine artichoke hearts along with liquid and chicken and let it marinade about 20 minutes. After it’s marinated, drain all liquid. Add garlic, oregano, salt and pepper. Broil on low about 6 inches from the flame for about 10 minutes or until golden brown, turn chicken and cook an additional 8-10 minutes and chicken is fully cooked. Top chicken with feta and broil an additional minute. Remove from oven and top with fresh parsley. Squeeze with lemon juice, if desired! I made this last night. It was good! But not sure how you ended up with 3 SP for a serving when the chicken thigh alone is 4 SP. Total SP for me was 5-6 depending on how much feta was eaten. Still a good recipe though. Would make again. Can I cook these in the oven without broiling? What time & temp would you recommend? Should the last line say “top with parsley” rather than oregano? Could I bake instead of broil? Fantastic recipe and so easy. First I used broiling method for entire recipe and it worked out very well. I like using thighs as they are more forgiving if over done. Turned out just right, good dish for company. I discovered this recipe on Pinterest and couldn’t wait to give it a try. I just finished eating and it was amazing! I sat down to leave a comment and looked at the picture and realized I had been so excited to eat that I forgot to add the feta! 🙂 It was delicious even without the feta. I am sure I will be fixing this again soon! Thanks! I didn’t think I liked chicken thighs, but these were sooooo good. I wasn’t quite clear on the “marinated in water” part, so I just used a 14 ounce can of artichoke hearts in water. (We would have been fighting over 6 ounces of artichokes, anyways.) Served with roasted red potatoes and roasted brussels sprouts. I lined the baking sheet with foil for easy cleanup, too. Off to see what other chicken thigh recipes I can find. Made this last night. It was amazing. I love this recipe and sometimes just cook it in our cast iron skillet on the stove top to cut down on time – we use boneless chicken breasts too. I also like to throw some baby arugula in and wilt it right at the end. We've added capers and sun dried tomatoes too. It's always a hit in our house! I made this tonight for my first meal in my new apartment. It's been a long week of moving, and my boyfriend and I are actually sick of pre-made junk food. This was so healthy, flavorful, and comforting that we both devoured it without appreciating how pretty it was (and it did look fancy). I used chicken breasts, which I baked for ~40 min at 375. I then added feta and baked for an additional 5 min. Finally, I threw it under the broiler until the cheese browned on top (~3.5 min). Next time I'm going to use 12 oz of artichokes and add lemon. Maybe a little bit in the marinade, or some zest on top to serve? Plated it with some asparagus and olive loaf bread, and will make it again and again. May I ask what size chicken thighs you use? Mine are approximately 4 oz each and the Tyson website says that is 160 calories. Obviously would be more per serving once you add in the feta and other ingredients. Wondering how many ounces you used to get 107 calories. Thank you! Any ideas how long it would take for bone-in skin-on chicken breasts? They are large…. about 1lb each. Should I bake first, then broil? Thx! This is my second time making this recipe. It's fantastic, easy, special and delicious! I served it with tabbouleh salad once and chickpea salad once. Two thumbs up! How much does an average thigh weigh.. Im trying to put this in my cacluator and for this recipe to come out to 3 points a piece they would be 1.5 oz is that correct? I know Gina said the artichokes should be in water, but I have never seen marinated artichokes in water and not oil…Can anyone recommend a particular brand to use? I tried it with chicken thighs and breast. Thighs are much better to me in this recipe. Made this last night – I'm not a fan of chicken thighs and this recipe confirms that. This meal might have tasted better with breasts. This was my least favorite meal of yours but since I use your recipes 99% of the week I'm okay with having one recipe not work. My husband liked it. But don't thi k I'd make this. I tried this for dinner tonight….absolutely delicious! I sauteed in a bit of olive oil and herbs rather than broiled but kept the rest the same. It was so easy! Thank you! So so yummy and fast. It turned out flavorful and moist after only 20 minutes of marinating. My hubby and I loved it. I served it with a Mediterranean type salad and bit of couscous. Gina thank you for all the fantastic recipes. This has become one of our favorites and my husband said he would never call it a diet recipe. He liked it so much, he has been making some of your other recipes! This was AMAZING!!! We just had it for supper and my hubby and I loved it! I made it in my Pampered Chef stone, and before putting the chicken in, I oiled the bottom of the stone and brushed garlic, oregano, and the salt and pepper in the oil. Then I placed the chicken and artichoke on top, and brushed another layer of the garlic, oregano, salt, and pepper. When I added the feta, I also sprinkled Greek seasoning on top. Simply AMAZING!! Great recipe! I made this with bone-in thighs; I baked at about 400 for 15-20 minutes, skin side down, then flipped the chicken over for another 15-20, then 5 minutes under the broiler for a little more color. Delicious–my meat-and-potatoes husband said, "Ooh, fancy!" when he saw it and, "Wow!" when he tasted it. Served it with some couscous. Super easy and delicious! This was so easy and yummy! I served it with cous cous and roasted broccoli. Husband had thirds and my 7 year old loved it too! I used my broiler for the first time to make this. It was delicious! I eschewed the seasonings and instead added a jar of no-salt-added, cubed tomatoes which were pre-seasoned with basil, garlic, and oregano. This was so quick and easy and tasted so incredibly good. Definitely something I will cook again! Made this tonight and it was terrific!! I used fat free feta bc that's all I could find in the store (aside from regular) and it was still great. Topped it with the recommended fresh lemon for just the right touch. Cook time was perfect for me. Like a previous poster said, the last line should be changed to say parsley instead of oregano. Just keep an eye on it so it doesn't burn. My oven doesn't have a high or a low broil, it just says broil. I think it gets pretty hot though. What do you suggest I do? This was fantastic, Gina! I do a lot of proofreading at work, so habitually caught a possible error in the instructions paragraph. I'm assuming you mean, top with fresh parsley vs. oregano. I also noticed that in the photo, the artichokes look a bit charred. Do you put them directly on the pan when baking or on the chicken? Thank you! I made this last week and it was delicious. 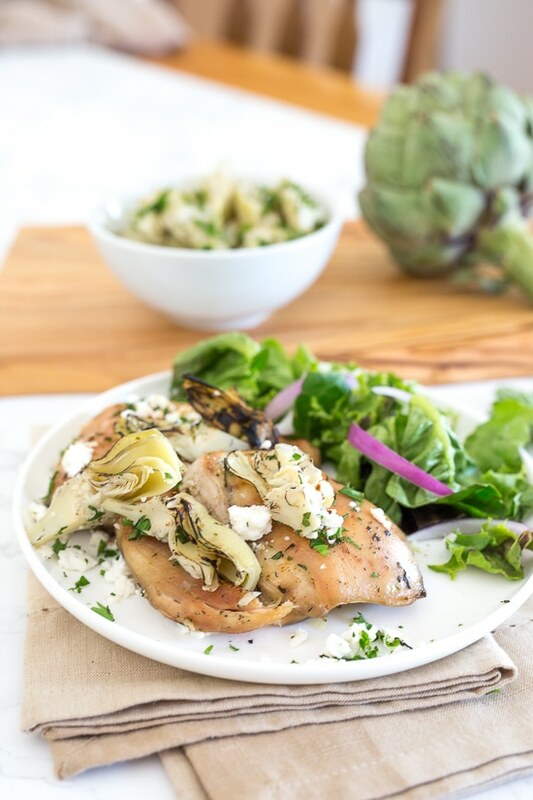 So simple and the broiled crispy chicken thighs mixed so well with the artichoke hearts. I used to only cook with chicken breasts but now I'm started to like chicken thighs more – the meat is more flavorful and doesn't dry out as much as chicken breasts do! This was so delicious! My husband and 3 year old loved it. Will definitely make this again. Thanks so much! The artichokes are in water. Hi, Are the artichokes in oil or water? Thanks! Definitely making this again! Great recipe. We Have made this 3 times now. The first 2 times in the broiler and it was great. Today, because it is so hot, we decided to make it on the grill in a grill basket….It turned out awesome!!!!! @Gina- Yep I have been using bone-in, as boneless chicken thighs are harder to find where I am. I really didn't think bone-in versus boneless would really make a difference. I guess it does! hi Stella, the chicken stated is boneless, which is never thick. I'm wondering if you used bone-in? I've been broiling chicken for years, Its my favorite way to make chicken actually! On a low broil not too close to the flame it broils wonderfully. Not all broilers are the same or have hi low options, so it could be your oven, or maybe you just like a more well done chicken. This of course could be baked as well. This is a tasty recipe, but I will have to agree with the others that the cook time is a bit off. I did the broil on low for 10 minutes on each side as on the recipe, and the skin got nice and dark and crispy-looking, but after we took them out and sliced into the thicker portions, they were still pink and bloody. Back into the oven at 375 for another 20 minutes to finish them off. I really don't think that just cooking them on broil will cook thick chicken thighs all the way through without burning the skin. Maybe first 375 for 25 minutes and then broil on each side for 10 minutes at the end? Random musings, that oil sounds delicious! Fantastic!!! Made this last night and it was a hit! I used thinly sliced chicken breast and drizzled with a tiny bit of meyer lemon olive oil. Served with pine nut cous cous. I made 5 meals from your blog in a row and all 5 were a hit! thank you! Susan, I'm sure it was a combination of the thighs and artichokes that made this chicken moist. AngelaS- 4 out of 4, great! Another absolute hit from your site, Gina!! Made this tonight and the whole family LOVED it! So far 4 for 4! I will definitely make this and serve next time we have company. Thank you!!!!! This was sensational! This was my first time cooking with chicken thighs. I'm not sure if the sheer moist perfection of this dish was due to the cut of meat, the artichoke marinade, or the cooking method…but nonetheless, this was SUPER moist and FLAVORFUL. I increased the garlic to 4 cloves and doubled the artichokes to 12 oz to ensure we all got some of the artichokes. My 4 and 6 year old loved it. I served it with brown rice and a salad. Will definitely be making this again and again! I made this for dinner last night. It was awesome! My husband told me to make sure I hold onto the recipe and make it often! Thanks for making WW fun and delicious! Sounds Great! Love your website!!!! Cous cous would be wonderful with this! Mmmmm… I am definitely going to pair this with cous cous. I had a recipe very close to this the other night at a dinner party, but there were olives and something else thrown in. Not a fan. She had it with cous cous and it was a beautiful dinner. The feta sounds like it will be an amazing replacement. I am excited to try this and about 30 other recipes. Thank you so much! Please update this recipe for points plus. This is amazingly good and we are making it again. I could not see the info needed to use calculator. Thanks for your update Samantha!! Glad it turned out great!! UPDATE: I used boneless, skinless breasts instead of thighs. I baked it for 25 minutes at 375. Then added the feta and baked for another 5 minutes. Finally, I put it on broil for 3 minutes. Turned out great! Thanks Gina! THANK YOU THANK YOU THANK YOU!!!! I am a lifer on WW and I always have conflict bc I love to cook and am not creative enough to come up with my own recipes. Since I found your site about 2 weeks ago I have used it for almost all my meals for my family. Last night was the greek meatballs with tzazki, tonight its the chicken thighs with artichoke hearts. 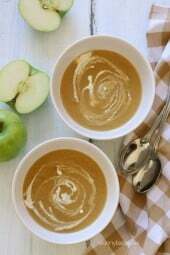 I have also made two other recipes from here….all have been wonderful!!! THANK YOU THANK YOU!!!! Samantha, You could always bake it, I'm not sure how your broiler would work. I live in an apartment and my old electric oven only goes to broil, no high or low option. Any suggestions? After spending a significant amount of time looking through the recipes on the WW site, I was starting to get a bit discouraged. So when I found this site, you have NO idea how happy I was. Everything looks amazing and there are sooooo many different recipes I look forward to trying. I really appreciate this site and you being willing to put the work in to keep it going and updated and figuring out the points for it all as well. This was delicious! I can't wait for the leftovers. Just found out about your website on Thursday and made this artichoke dinner tonight. It was easy and delicious!! Thanks so much for creating this website and for taking the time to share your talents with us. I'm a huge fan! @Kari- The longer the better! Will be fine!! Gina, is there a problem leaving this to marinate all day? I leave for work about 7:30am, won't be able to get this into the broiler until 5:30pm, am I OK leaving it to marinate that long? Thanks for sharing on your blog Stephanie! Thanks for the simplicity and deliciousness. I'll be looking forward to trying many other recipes from your collection! I had this for dinner tonight and it was quite tasty!!! I added a bit more garlic since I love it and the flavors were delicious. I used a broiler pan for the person asking what kind of pan to use above. THANK YOU!! I am trying this tonight & I *can't* wait!! Wow, 40 minutes! Is it an electric broiler or gas? Maybe it was too far from the flame? All ovens are different but that's a long time! I made this for my husband and parents last night and there were rave reviews all around! Only thing was it took a lot longer to cook than the recipe said – maybe my broil wasn't getting hot enough but it probably took me about 40 minutes total. Turned out delicious! Teresa- I only broil steaks or lamb chops on high…Chicken always on low and a bit of a distance from the flame. Thanks for leaving a comment! We had this tonight for Valentine's Day dinner, and it was delicious! Broiling has always made me a bit nervous, because I've been afraid to burn things. Broiling on low was no problem at all, and the chicken turned out so moist and tender. What a great way to cook chicken! Thank you for sharing such excellent recipes. I made this one last night and thought it was supurb! I didn't have the marinated artichokes, so I used regular ones, added a little oil and soy sauce, with the spices and let it marinate for about 40 minutes. It turned out great! We had it with the breaded zucchinni too! Awesome! My husband and I just had this and I can't wait to make it again. Love your site!!! I made this using the Harry and David Merlot Laced Artichokes and it was fantastic. It was so easy for a weeknight meal. I love how simple this is. Thanks for sharing! Yes, this is super easy! I would use a rimmed baking sheet. A friend in my Weight Watchers group recommended your site. 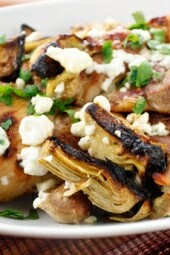 The first recipe I tried was the "Chicken Thighs w/ Artichoke Hearts & Feta Cheese". It was delicious and very easy to make. I will definitely try more recipes in the future. Thanks sooo much! What type of pan do you broil the chicken in? Thanks! 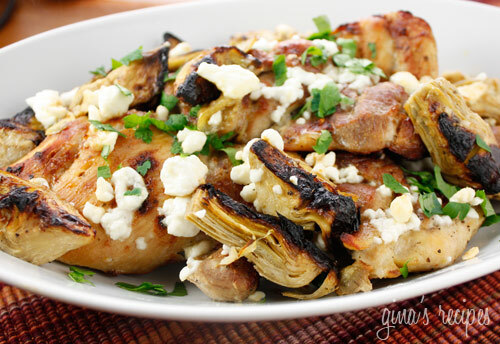 Just made and ate the Chicken Thighs with Artichoke Hearts and Feta Cheese. It was such and easy recipe, and so good!!! The whole family loved it! Love you site. I made this for dinner tonight and served it with a Mexican rice and the baked cauliflower. My first dinner in my new home, with a good friend, what a success! Thanks so much! Good for you Jill and Will!! That's an amazing accomplishment. Weight Watchers really works! Can't wait to try this recipe. Love all your recipes. Made the Cauliflower fritters last week, they were great! Can't wait to try this recipe. I love all your recipes. The Cauliflower fritters are delicious. Wow, I just stumbled on this site and wish I had found it a lot SOONER! My husband is on WW and it's so hard to find good WW recipes with the points factored in. I'm not on the plan, but why not eat like that for meals? It's healthier! Thanks!! This looks delicious – love all those flavors! I LOVE your website! And I just want to let you know that my heart skipped a beat when I saw your Pio-Pio inspired Chicken! It's my FAVORITE restaurant! 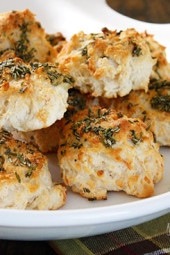 I will be making it this weekend, thanks so much for the wonderful recipes!!! Wow!!! you have some really incredible recipes! I've been exercising and eating right and I've lost 40 pounds so far. I'm still in the proces of learning different foods and your site will come in handy!! Would you be interested in writing a guest post on my blog? Looks terrific. I've saved it for the future. I love feta in anything! This looks like tonight's dinner! Thanks so much!! Oh, I wish I hadn't already been to the grocery store for the week. Yum! This definitely goes on next week's menu. I could spend hours looking at your recipes. Everyone looks so delicious and so doable. So far I have made the Skinny Chix Parmesan, the Sante Fe Chicken and Baked Zucchini Sticks. Have loved it all. Keep bringing it on, gonna do the Garlic Shrimp this weekend. I hit my WW goal last night. Lost 51.2 lbs since April. This is great! Good for you! That looks not only fantastic, but doable in terms of calories on any diet! this looks super delicious. Thanks for maikng healthy things look yummy.